Links page #1 Vendors of traditional kilts and accessories. Tartan finders. Links page #2 Vendors of non-traditional kilts, sarongs, man-skirts and other skirted garments. Links page #3 Kilt and skirt forums, private home pages, picture galleries, videos, articles in print media and on the internet, men in kilts and skirts on stage and on the cat walk etc. When buying your first kilt or you just want a kilt to wear in situations where an expensive wool kilt would be overkill, an off-the-peg kilt might be a good choice. They typically are 5 or 8 yard kilts, made of PV or an acryllic fabric and 24" long and well under £100. Kilts in the £25-35 range might give you less value for money than kilts selling at about £50-£60. Also wool kilts are available off-the-peg, but at a considerably higher price. To EU-citicens Brexit shall mean more expensive kilts. It is where I should start when looking for a fine ready made kilt. Marchbrae 6 yard 16 oz. wool kilts, 24" long. Syriel, a German kilt vendor, knows how a fine kilt should be made. Until some years ago she would sew kilts made to measure but now she is concentrating her business on imported ready made kilts in a quality she can answer for. The range also comprises tartans not seen with other vendors and prices look competitive. At a modest price she will shorten your kilt from standard 24" to your preferred length. Unfortunately you cannot pay with your credit card yet. Hopefully Syriel is going to change that soon. Unlicht - Düsseldorf Friedrichstraße 117 D-40217 Düsseldorf-Bilk Mo.-Fr. 12-19; Sa. 11-19. Cheap kits made to measure. Wanting a kilt in wool, which really fits you when it comes to waist and length and where you'll have a lot of tartans to choose from, go for a kilt made to measure. It doesn't have to be that expensive. Only kiltmakers giving you the option to order your kilt online, according to your measures, are listed below. By Kilts & more you can have a 4 yard box pleated kilt at the same price as a 5 yard kilt pleated to the stripe. (A box pleated kilt takes less yardage). At Kilt Society they have a vision of making the kilt everyday attire for men wherever they live; an attitude which to my opinion should be highly appreciated. Also, Kilt Society might have one of the best designed web pages, making it incredibly easy to order a kilt to measure or other items. Have a look at their "Kilt Society Custom Made Kilts" in 5 and 8 yard. For smart casual wear I should recommend the 5 yard kilt. You have several hundred tartans to choose from. On most tartans you’ll have to pay an additional fee, but actually it is not difficult to find tartans which shall not cost you extra. It should be a natural thing, but unfortunately, on the kilt market basic prices are sometimes pure theory. Scotweb – a major Scottish kilt vendor – is offering a 5 yard "Essential Scotweb Casual Kilt. It is not a woolen kilt, but being custom made from UK-made, machine washable poly viscose in no less than 120 different tartans and costing no more than £135 it seems to give high value for money. Even if it is a “from” price all tartans seem to sell at this price. Positive. Scotweb also sells a five yard made-to-measure casual kilt, designed to sit low, i.e. like jeans, but unless you can use one of the very few kilts in stock be prepared to pay considerably more than their "from price" indicates. Don't miss the Rettl & Friends magazines. The link gives you access to 16 beautiful magazines. They are in German only, but if you don't understand the language, just enjoy the pictures. 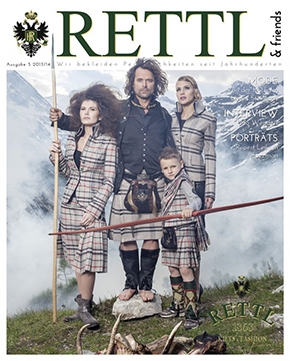 In fact, no kilt maker and vendor I know of does so much as Rettl when it comes to promoting the kilt - High quality kilts as fashion. Lady Chrystel is a specialist in making box pleated, double box pleated and kingussie pleated kilts. Scottish Kilts Cheap kilts made to measure. Kilts in Hamburg - Ladage-Oelke GmbH Neuer Wall 11, 20354 Hamburg Mo.-Fr. 10.00 – 19.00 Uhr Sa. 10.00 – 18.00 Uhr. Affordable made to measure kilts in PV. According to the company no taxes or fees should apply when delivered in Europe. Matthew A.C. Newsome, Hand crafted kilts and knit wear. Matthew A.C. Newsomehas also written some fine articles on kilt wearing. Scottish Kilts. At Scottish Kilts you are not limited to the 24" standard length on affordable kilts. Being really light weight the Sport Kilt is just perfect in a hot climate. For informal occasions where you might otherwise feel comfortable in shorts, it is great – provided you don’t expect it to be a traditional kilt. I don’t. And it is not. It’s an unpretentious kilted garment of its own and for the mentioned purposes I can highly recommend it. USA Kilts.com makes a very nice 4 yard kilt according to your measures, called USA Kilts Casual. Being closed by means of Velcro it is more flexible regarding waist size, and when a kilt is worn together with a wide belt no one can see that the buckles and straps are missing. The lack of metal parts also means that it shall set no alarms at airports. Most kilt vendors will also sell you all kinds of accessories to go with your kilt, like sporrans, belts, buckles, kilt pins, garter flashes, and kilt hose. But you'll also find enterprises specializing in accessories. This cpmpany sell some very nice kilt hose at a very favourable price and in several colours. Highly to recommend. Should you feel tempted to go commando but are also concerned about hygienic aspects, the solution is kind of "under kilt" or half slip, which - when worn under a kilt - is called a kilt liner. Instead of an authorized kilt liner you might go with a skater skirt, sometimes called a circular skirt. It makes the perfect kilt liner or kilt protector. But yo have to find it in women's stores. Project No Bucks US Kilt stickers and T-shirts, among them "Real Men Wear Kilts". Thinking of making kilts a business? Having had the opportunity to try on a utility kilt from UK Expo International I must say that I'm most impressed by the sewing quality, the fabric and overall design. UK Expo International also makes tartan kilts and kilted skirts for the ladies. Many suppliers to chose from.